anna schuleit’s “bloom” | Abler. 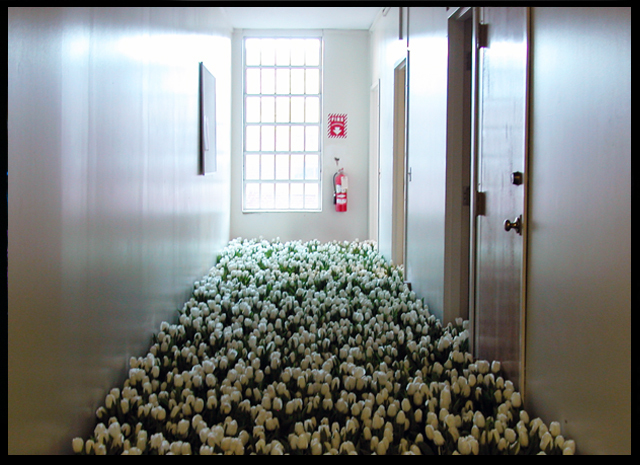 Anna Schuleit’s Bloom is one of my long-held favorite installation works, and it’s a perfect Abler project. So why haven’t I featured it before now? It was staged at the Massachusetts Mental Health Center in 2003, in the days before the center shut down, after nine decades of patient care. 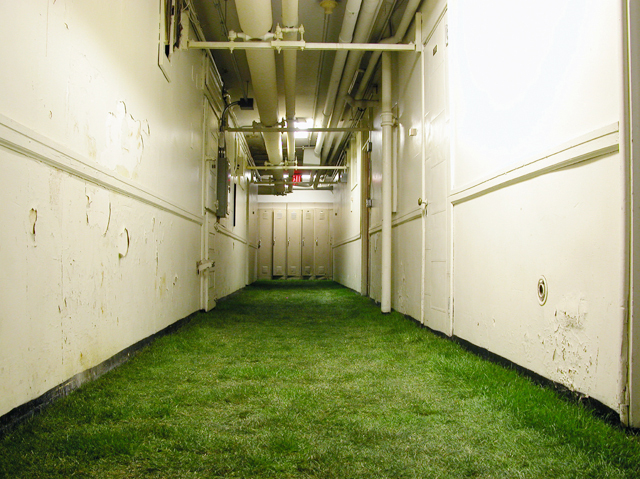 Schuleit covered the entire four floors with 5,600 square feet of sod and 28,000 blooming flowers. 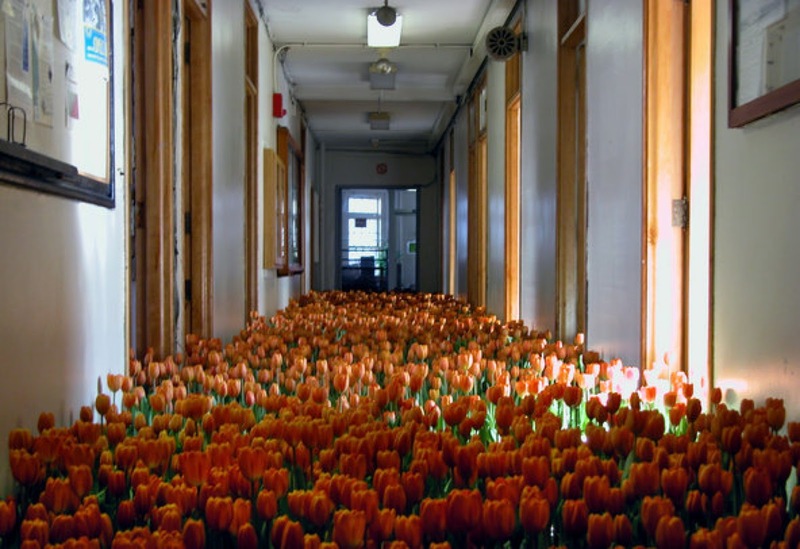 Schuleit says the work addresses, in part, the strange lack of flowers in psychiatric settings, while they appear everywhere in other clinical environments. That distinction packs so many assumptions about who is sick, and why, and how. And it’s impossible not to consider the modes of care, such as it was—restraint, or nurturance, or abuse—that would have transpired in a many-decades-old institution. These settings are always an index of the wider culture, revealing how we care for those whose maladies often can’t be seen. Schuleit also piped in sounds through an old PA system, the snippets of conversation and ambient sounds of the building in its last days. And then the entire structure was open to the public for four days, to explore and remember. 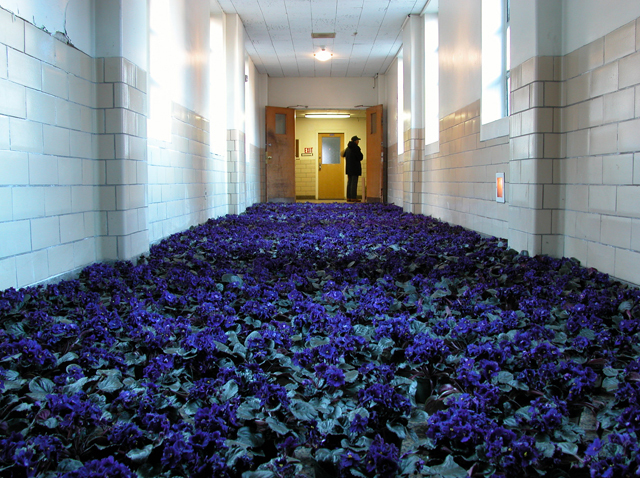 After those days and the building’s closing, all the flowers were donated to shelters, psychiatric wards, and halfway houses around Boston: a big extended gift to many invisible people. There’s a great interview and more photos here. More on Anna Schuleit. Amazing.I love this so much. Thank you for posting! Abler was run by Sara Hendren between 2009 and 2017. I tracked and commented on art, adaptive technologies and prosthetics, the future of human bodies in the built environment, and related ideas. It was a time when discussions on the web weren't yet entirely dominated by social media, and it was an exciting moment to be blogging—putting together unlikely bedfellows next to one another, magazine-style, to see what sense could be made by thinking aloud, together. I was writing about prosthetics in the ordinary sense, but also about assistive technologies in the far less ordinary sense: low tech tools, hybrid technologies, art works, and more. The ideas were associatively connected, restless with questions. And all of it, in retrospect, was a platform, a runway for me to write myself into a mode of working as a design researcher and artist. You can see some of my current and ongoing projects—making, writing, speaking, and even, yes, still blogging—here. I tweet. You can use this site by going straight to the archives for past posts, or you can use the guide here on the home page.